I’ve been working on a blog post about some great Pittsburgh Christmas gifts, but a tweet came across my radar with a Pittsburgh product that is probably worthy of its own blog post. Chipped chopped ham is a distinctly Pittsburgh lunch meat. If you didn’t grow up in Pittsburgh, and you aren’t familiar with the chipped chop ham or ham barbecue – head over to the chipped chopped ham Wikipedia page for a full education. The fact that chipped chopped ham has its own Wikipedia page should be an indication to you that this is something Pittsburghers take seriously. 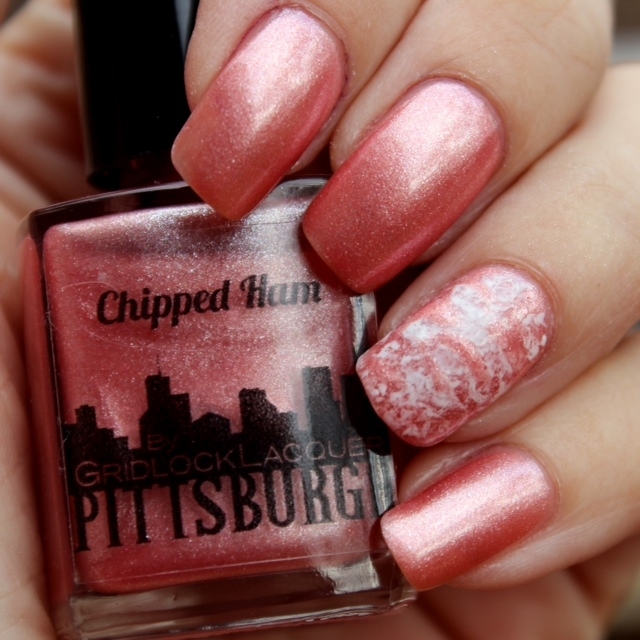 …for $7 you can now paint your nails in a color inspired by chipped chopped ham. Click here to see all three of the Pittsburgh colors. We can only assume that the most gilded shade of gold will soon be added to the Pittsburgh collection. The company is based in Buffalo, NY – so maybe they haven’t yet discovered our loyalty to the shades of black and gold. I help but wonder if there is a buffalo sauce share of nail polish in the Buffalo collection. 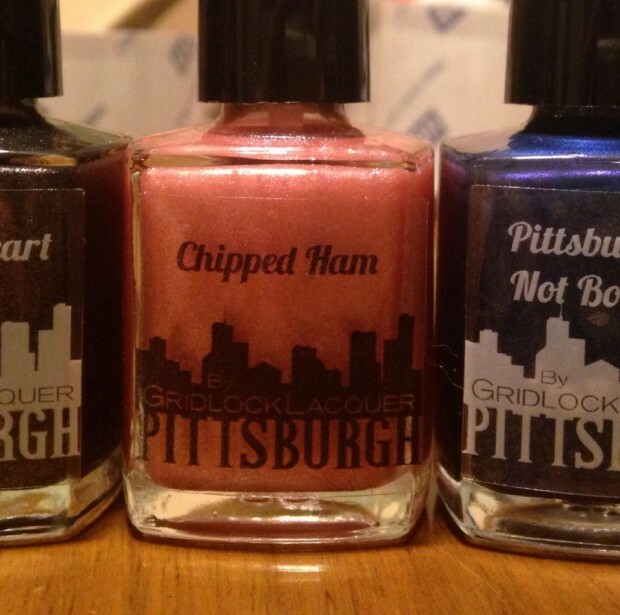 All of these colors and colors for other rust belt cities are available on Gridlock Lacquer website. Follow @GridlockLacquer for more updates. Christmas delivery is a maybe. I’ve asked Gridlock to keep me posted on this. 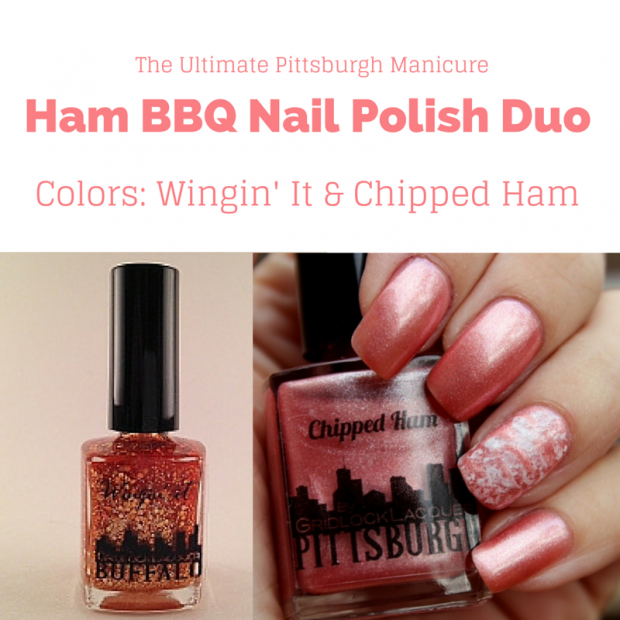 Yes, there is also a shade for the BBQ sauce, meet Wingin’ It – so you could have chipped chop ham BBQ nails. « CHS Gift Project Party @ Houghs – Will YOU Help Us Reach Our Goal?